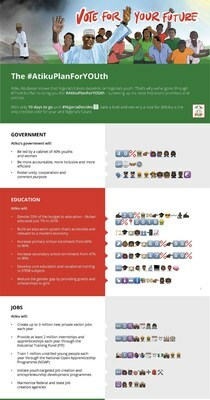 The campaign of Nigerian presidential candidate for the People's Democratic Party Atiku Abubakar today launched the #AtikuPlanForYOUth, the world's first 'emojified' manifesto (on http://www.wevoteatiku.com) in a new effort to attract youth voters. Devote 25% of the budget to education - Buhari allocated only 7% in 2018. Nigeria's slowing economy and failing education system have driven youth unemployment to record highs - reaching 38% in the second quarter of 2018. Only 50% of children finish primary school with many of them unable to go to secondary school, resulting in seven million young people each year entering a struggling labour market with few if any relevant skills. Campaign spokesman Osita Chidoka said: "The #AtikuPlanForYOUth is our way of speaking directly to young people with a positive message of hope for their lives and careers. The #AtikuPlanForYOUth was created and launched by @WeVoteAtiku - part of the official PDP election campaign. With Election Day on Saturday, February 16, the campaign is entering its final phase to rally voters behind its pro-business message. The People's Democratic Party (PDP) is a major contemporary political party in Nigeria. Its policies generally lie towards the centre-right of the political spectrum. It won every Presidential election between 1999 and 2011, and was until the 2015 elections, the governing party in the Fourth Republic. Currently, PDP controls 14 states out of 36 states in Nigeria. #WeVoteAtiku is a PDP-backed social media campaign to inform and empower Nigerian youth to vote for a better future for themselves, friends and family by voting for Atiku. PDP's aim is to get Nigeria's youth out to vote for Atiku and the PDP by highlighting the reasons why a vote for Atiku is a vote for their own and their country's future. Nigerian youths deserve a better future. On Saturday, February 16, go vote @Atiku Abubakar for President and make it happen.